It turns out that with the right cooling AMD’s new Ryzen CPUs can be overclocked very well indeed. 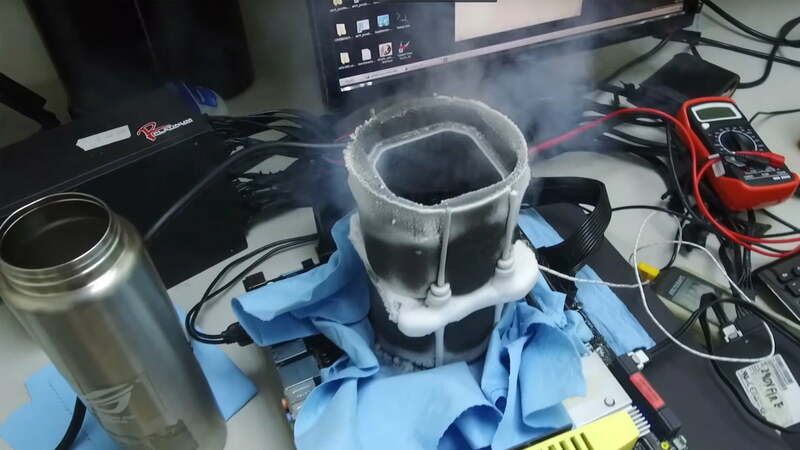 Although 4GHz tends to be the rough barrier for air cooled Ryzen CPUs, one overclocker has given a Ryzen 5 1600X processor a bath in liquid nitrogen and with that cryogenic fluid in place, he was able to clock it as high as 5.9GHz without disabling any cores. One of the commonplace tricks to raise a processor’s clock speed is to disable other cores and threads. When the CPU only has to make calculations with one or a few of its cores, it doesn’t have to work so hard and therefore doesn’t require as powerful a cooling solution. That’s what makes this AMD Ryzen overclock so impressive, because the person behind it kept the chip running in a stock configuration, at anything but stock clocks. The overclocker in this instances was OC expert and YouTuber der8auer, who went to an Asus testing facility in Taiwan in February to test out Ryzen CPUs and see what they are capable of. While he admits that some of the records he broke there have since been beaten by other overclockers, the Ryzen 5 six-core, 12-thread record stands. The final clock achieved was 5,905Mhz and he has the HWBot results and CPUZ validation to prove it (thanks Hexus). As well as the raw clock speed record for the Ryzen 5 1600X CPU, der8auer also managed to achieve records for six core CPUs in GPUPI for CPU, Cinebench R11.5 and GeekBench3. Each of those records has a reasonable lead over the number two spot, but most impressive in this case is that every other member of the top 10 in each of those categories is an Intel CPU. It’s also interesting to note that those scores were achieved at lower frequencies than the runner-up Intel chips. Later on in the above video, der8auer highlights how in some cases the weaker-scoring Intel chips were clocked as much as 700MHz higher than the Ryzen 1600X which took the top spot. Other hardware used for test runs included an Asus ROG Crosshair VI Hero X370 motherboard running a BIOS from February 8, 2017, G.Skill Trident Z DDR4 RAM and a 128GB Samsung solid state drive. All benchmarks were run on Windows 10 64bit. Also of note was der8auer’s praise of the Ryzen physical architecture when it comes to cryogenic cooling. By having the pins on the CPU itself (PGA) rather than on the motherboard (LGA), he said there was much better contact between the cooler and the processor.